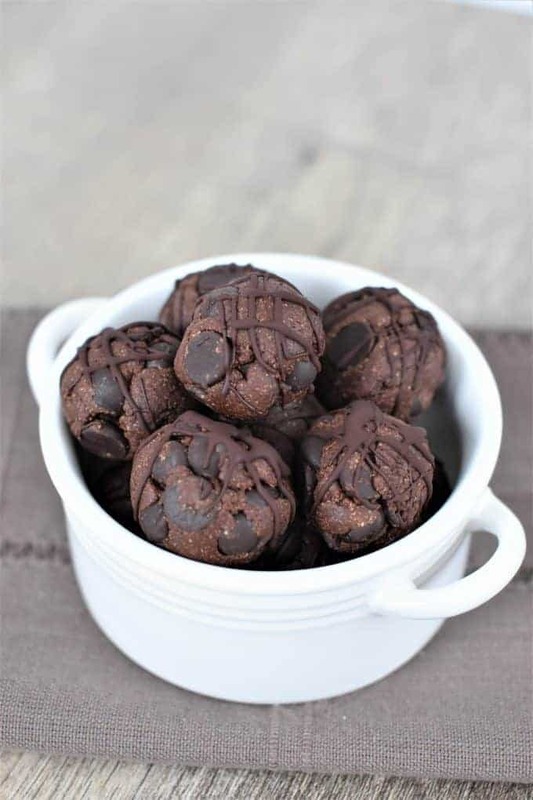 These vegan, gluten-free Double Chocolate Chip Cookie Dough Bites may be small, but they pack some serious chocolaty flavor. If you have children, then you may recognize this parody of the song, “Ketchup on Everything” from the Disney Channel show, So Random! If not, you can check it out here. My favorite part of the song is when they mention ketchup on pickles (0:57 seconds into the video). I LOVE ketchup on pickles. My kids think it’s gross, but let’s put it into perspective, shall we? Picture this: You have a burger (meat-based or plant-based, depending on your preference). You top said burger with pickles. Then you squirt on some ketchup. You are now eating ketchup on pickles. 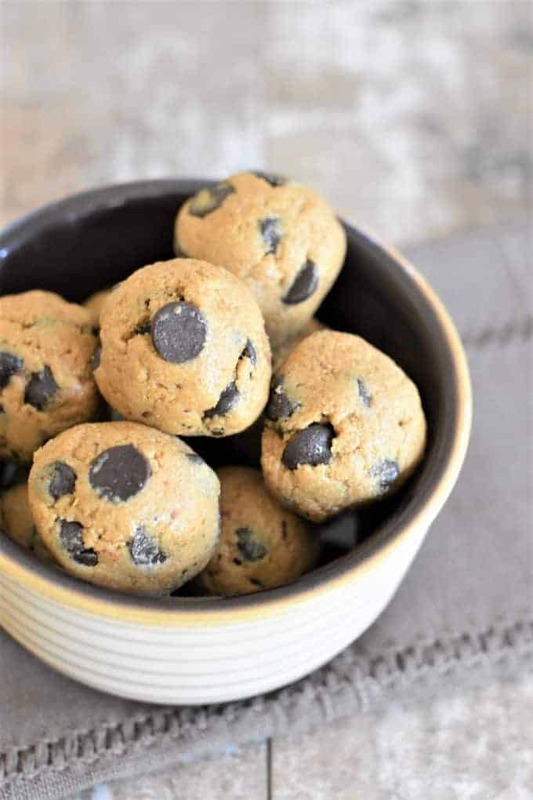 Now, about that chocolate I mentioned earlier…you probably won’t want to put it on pickles, but you will want to put it on these Double Chocolate Chip Cookie Dough Bites! All that rich chocolate cookie dough topped with even more chocolaty goodness in the form of CHOCOLATE DRIZZLE! Disclaimer: When you make these cookie dough bites, you may or may not be tempted to eat the whole batch. First, line a baking sheet with parchment paper and set aside. Using a spoon, mix unsweetened applesauce, coconut sugar, maple syrup and vanilla extract together in a mixing bowl. In a separate bowl, stir together gluten-free oat flour, unsweetened cocoa powder and kosher salt. Add oat flour-cocoa powder mixture to the wet ingredients and stir to combine. Fold in vegan, refined sugar-free chocolate chips. Use a small cookie scoop to scoop out dough and form into balls with your hands. Place dough balls onto parchment-lined baking sheet. Place in freezer for 10 minutes. While cookie dough bites are in the freezer, make the chocolate drizzle. Combine chocolate chips with coconut oil in a small, microwave-safe bowl. Microwave in 15 second intervals, stirring between each one, until chocolate is smooth. Set aside until ready to use. Dip a small spoon into the melted chocolate and using a back and forth motion, drizzle a line of chocolate across the top of each cookie dough bite. Repeat going in the other direction. Place cookie dough bites in the freezer for 10 more minutes. Using a spoon, mix applesauce, coconut sugar, maple syrup and vanilla extract together in a mixing bowl. In a separate bowl, stir together oat flour, cocoa powder and salt. Add the dry ingredient mixture to the wet ingredient mixture, and stir until combined. Use a small cookie scoop (I recommend a #50 or #60 disher) to scoop out dough and form into balls with your hands. Place dough balls onto parchment-lined baking sheet (makes approximately 10-12 dough balls). While cookie dough bites are in the freezer, make the chocolate drizzle by combining 1 tablespoon chocolate chips and coconut oil in a small, microwave-safe bowl. Microwave in 15 second intervals, stirring between each one, until chocolate is smooth. Set aside until ready to use. Keep cookie dough bites refrigerated in an airtight container for up to five days. They can also be kept in an airtight container in the freezer for up to 2 weeks. They look and sound delicious! Love that are vegan and gluten free, will definitely try them soon! YESSS! I have everything to make these on hand! 🙌🙌🙌 I have a funny feeling I won’t be able to fight the urge to eat the whole batch in one sitting. They look SOOO good! The perfect sweet treat without the guilt! The perfect combo of chocolate, sweet and whole ingredients. I love to keep these stocked in the freezer. Yes! I’m always looking for snack recipes and these look so simple and delicious. Love that they’re vegan too! I’ve never been into cookie dough, vegan or not, but I am all for chocolate on everything. These look really yummy! I struggled with that myself lol 🙂 Thanks so much, Michelle! Now, these are my type of snack!! I love that they are healthy because that means I can eat a lot of them and not feel guilty! These look so so good! I can’t quite believe they are vegan, they look so decadent! Look forward to making these! LOVE LOVE LOVE. This is a simple, yet delicious and satisfying snack. So easy to make too! Did I mention that I LOVE it??? Yep, I’m all about chocolate on everything! Well, not pickles. lol These look so delicious and so easy and love that I can make them for my daughter when she visits since she’s gluten-free.